Greeting all. 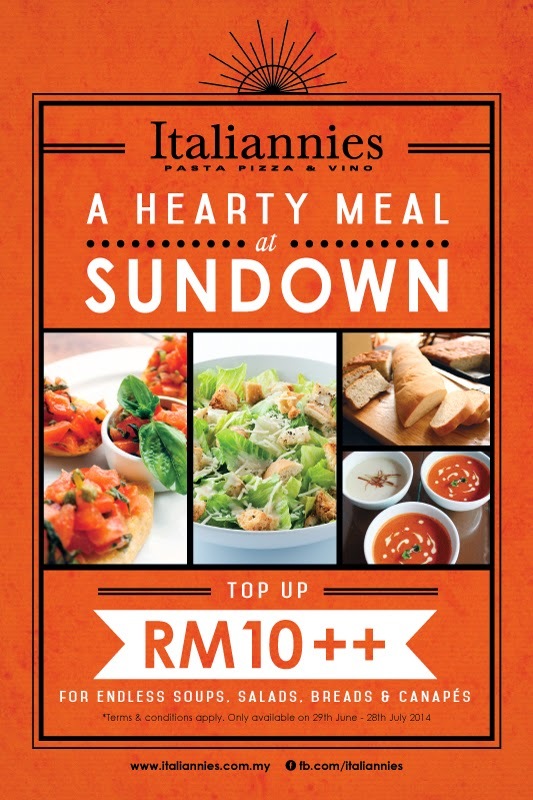 Starting 1 July 2014 to 27 July 2014, we able to enjoy a mouth-watering buffet spread with its new Sundown Buffet at any Italiannies outlets. "Savor the wonderful Italian Flavours and dine in at any Italiannies outlet after sunset". Quattro Platter is a combination of deep-fried risotto balls, calamari, fried lemon cheesy balls and zucchini strings, complete with Marinara and Alfredo sauce of dipping. The NY Strawberry Cheesecake is a New York style cheesecake served on a bed of strawberry soft. Luscious Spaghetti & Meatballs is really juicy, huge homemade meatballs, served with spaghetti in their own signature marinara sauce, Lasagna A La Ravina. Lasagna A La Ravina is a harmony of savory minced meat ragout, with cream sauce and layer of lasagne baked to perfection with Mozzarella cheese. The Tiramisu is a lady fingers cookies dipped in liqueur and espresso with layers of creamy mascarpone cheese mix and topped with dark chocolate powder. Pizza Enorme is and 16" family pizza that come with 4 types of favours such as Pepperoni, Turkey ham and also pineapples, shrimps and mushroom and roasted garlic, and the classic pepperoni pizza. The classic pepperoni pizza is topped with generous amount of beef pepperoni, Mozzarella cheese and shaved onions. Promotion Period :- 1 July 2014 - 27 July 2014. Lot 1-31, Level 1, Gurney Paragon Mall, Persiaran Gurney, 10250 Pulau Pinang, Malaysia. Lot CF15 & 23, Level CF, Paradigm Mall, Kelana Jaya, 47301 Petaling Jaya, Selangor, Malaysia. Don't forget to follow my network too. Do mention for a follow back :). Have a nice day everyone!